Toad Houses (also known as Toad's Houses) are Mushroom-shaped buildings that first appeared in Super Mario Bros. 3. They have since made appearances in more recent games. Toad Houses are usually located across every world map except for the last world within the Super Mario games. Toad Houses always hold either a useful surprise or reward for the player. Within most games, Toad Houses are generally run and hosted by ally characters such as Toad, Toadsworth, and a variety of other Toads. The Toad House interior, from the NES (left), SNES (middle), and GBA (right) versions. In Super Mario Bros. 3, upon entering a Toad House, Toad will appear and present the player with three Treasure Chests. While it's implied that each chest has a different content, the game's code randomly decides the item given only after opening a chest, meaning there's no advantage to pick a chest over the others. Toad Houses in earlier worlds tend to hold more basic power-ups such as Super Mushrooms and Super Leaves, while the ones in later worlds may hold Tanooki Suits and Hammer Suits. The player may only open one chest, after which the Toad House cannot be accessed again. In World 1-3, if the player presses and holds on the white block near the end of the level, Mario or Luigi will fall "behind" the level's objects (bushes, blocks, enemies, etc.). If the player continues to run right, they will end up behind the black background at the end of the level, where a secret Toad House holding a Magic Whistle can be found. Pre-release screenshots of Super Mario Bros. 3 showed that Toad wouldn't be the only one hosting Toad Houses - a Koopa Troopa and a Hammer Brother would also run them. Dark Land is the only world in the game that does not feature Toad Houses. The interior of a White Mushroom House in Super Mario Advance 4. 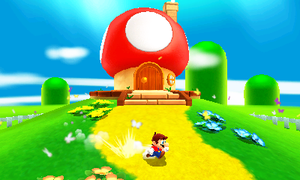 If a player collects a certain amount of coins in a world's particular level, a White Mushroom House, also known as White House, will appear (in remakes of the game, these Toad Houses are colored blue). Within these special Toad Houses lies a single chest. A Magic Wing can be found in the chest in odd-numbered worlds, while an Anchor will appear in even-numbered worlds. The following shows the criteria for unlocking the White Mushroom Houses. Toad House in BS Super Mario Collection. 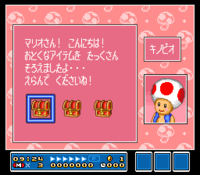 In BS Super Mario Collection, Toad House is a screen with pink background where the player simply chooses one of the three chests, which may include 1-Up Mushrooms. They appear in week 2 and 3 installments, which are based on Super Mario Bros. 3. A variant known as 「なえのいえ」 (Nae's house) is hosted by Nae Yūki, who narrated the game with live audio. This house appears as a Fire Flower panel on a world map on all the known installments. Similar to Toad Houses, they are screens with yellow background. By answering yes to both of Nae's questions, players activate 「おばけモード」 (ghost mode) that allows them to become Fire Mario as they exit a level, but prevents them from participating in rankings. In Super Mario Advance 4 and the New Super Mario Bros. series, the player will have unlimited access to default Toad Houses after total completion. There are also three different colored Toad Houses in the bonus World-e of Super Mario Advance 4: Super Mario Bros. 3. However, instead of containing items in chests, they have minigames that reward random items. To unlock the gates blocking them, one must collect the required amount of Advance Coins. Blue 30 A-coins Dig! Dig! Dig! However, the full complement of e-Reader level cards were released only in Japan. In North America, the maximum number of Advance coins obtainable in the GBA release was 44 (49 counting the one promotional level), leaving only the first minigame unlockable, while in other regions, the e-Reader was not released at all. In the Virtual Console release of the game, all e-Reader levels were available worldwide without the need for cards, and so all of the minigames can be unlocked. Pre-release screenshots of Super Mario World showed Toad Houses were going to appear in this game. The Top Secret Area has a similar function to the Toad Houses in the final game, but can be used infinitely. 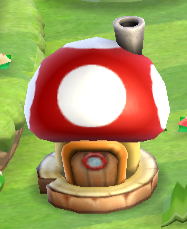 Power-Up Toad Houses are capped by a red mushroom on the world map. A giant Roulette Block alternates between a Mushroom, Fire Flower, Blue Shell and a Mini Mushroom. Whatever is displayed when Mario or Luigi bumps it from below is what will be stored as the backup item. If a brother has a backup item already and the item chosen has less or equal value to the original backup item, 1000 points are awarded instead. 1-Up Toad Houses are capped by a green mushroom. Six ? Blocks are spread out. Three contain a 1-Up Mushroom card. One contains a 1-Up Mushroom X3 card, which is equal to 3 1-Ups. One contains a X2 card. One contains a Bowser card. The X2 card doubles all cards already revealed, and the Bowser card ends the minigame (though Mario keeps any 1-Ups revealed). Up to twelve 1-Ups can be won, and if Mario hits the ? Block with a Bowser card right away, no extra lives are awarded. Mega Mushroom Toad Houses are Mushroom Houses that look like Mega Mushrooms. When Mario or Luigi enter this house, Toadsworth will create a Giant ? Block. When hit, a Mega Mushroom will appear. The Mega Mushroom gained from the Mega Mushroom House will override any item in the item slot. Like other houses featured in New Super Mario Bros., Mario will usually have to pay five Star Coins to pass the signpost leading to the Mega Mushroom House. These Toad houses are featured in every world of New Super Mario Bros..
A single Blue Toad House is found at the beginning of World 1 after beating the game. Inside it, there are blocks with different designs on them. These are the different backgrounds the player can select for their Nintendo DS's touch screens, and they cost twenty Star Coins each. After Mario or Luigi open up all the Star Coin Signs in the game, a fifth background can be chosen. By ending the level with the last two numbers of the time limit being the same (except 00), three things are triggered: The Super Mario Bros. "Course Clear" theme plays instead of the normal one, fireworks go off (1 for ending in 11, 2 for ending in 22, and so on, awarding 4,000 points per explosion for a maximum of 36,000), and a bonus Toad House appears at the starting point where Mario first enters the world. Time limits ending in 11, 22, or 33 yield a Power-Up Toad House that awards items, 44, 55, and 66 yield a 1-Up Toad House for an extra life minigame, and 77, 88, and 99 yield a Mega Mushroom Toad House for a Mega Mushroom reward. None of these houses are permanent, even after completing all of the levels in the game. A red Toad House (left) and the interior of a Star Toad House (right) from New Super Mario Bros. Wii. Icons for the three different Toad Houses. Toad Houses reappear in New Super Mario Bros. Wii. Unlike the first New Super Mario Bros., this game does not require Mario to collect Star Coins to open Toad Houses. Instead, the player will automatically unlock them when certain levels are completed. Also, a Toad House will appear at the start of the world if Fireworks are triggered, like the predecessor. In single-player, this is accomplished by rescuing a Toad. In multiplayer, all players must reach the flagpole when the last two digits of the remaining time are the same. In both modes, the last digit of the remaining time tells how many fireworks are set off and each one adds 4,000 points to the player's game score. After using a Toad House, the players will get a tip, reminding them to use items on a tough course in Power-Up Houses or to visit Princess Peach's Castle to watch Hint Movies in 1-Up Houses. There are three colors of Toad Houses: red, green, and yellow. If Mario gets a red Toad house, he will play Power-up Panels. If he gets a green Toad House, he will play the game 1-up Blast. If he gets a yellow one, he will get a Super Star as a reward in the treasure chest. All Toad Houses become permanent in this game, as well, when the player's save file contains five stars. In Power-Up Toad Houses, Power-up Panels is played by matching two of the same items. If two Bowser or Bowser Jr. images are matched, the game ends and Mario keeps the items earned from the game. In 1-Up Toad Houses, 1-up Blast is played by hopping into a cannon and pressing to shoot out and pop balloons to earn extra lives. Star Toad Houses contain one Super Star in a chest, and they are much rarer than the other Toad Houses. These houses have white roofs with multiple stars around the house. Like in New Super Mario Bros., Toad Houses can appear at the starting points of worlds by using the same strategy. In multi-player mode, the strategy is exactly the same, but since there are no Mega Mushroom Toad Houses, Star Toad Houses appear when the time limit's last two digits show 77, 88, or 99, and the times for the Power-Up Toad House and 1-Up Mushroom Toad House are flipped. In single player mode, the strategy is slightly different. Instead of finishing the stage with the last two digits of the time limit being the same, if Mario or Luigi saves the Toad in the level and takes him to the end, only the last digit counts (e.g. 1, 2, and 3 make a 1-Up Toad House appear instead of 11, 22, and 33). Once again, these Toad Houses aren't permanent. The inside of a Red Toad House in Super Mario 3D Land. Toad Houses make a reappearance in Super Mario 3D Land where they are manned by Toad himself and a variety of other colored Toads (depending on the situation). The red Toad Houses (which are run by Toad) often provide Mario with power-ups that would be able to help the hero on his journey. If Mario or Luigi leaves the Toad House without collecting a power-up, the Toad House will disappear regardless. The Toad Houses also allow players to access gifts that they receive via StreetPass, known as StreetPass Gifts. The number of power-ups that Mario can receive from StreetPass Gifts depends on how many times the player has encountered the same Mii with StreetPass. A maximum of five power-ups can be received at the same time, from among Super Mushrooms, Fire Flowers, Super Leaves, Boomerang Flowers, and Statue Leaves. P-Wings may also appear occasionally. Without the use of StreetPass, only Super Mushrooms, Fire Flowers, and Super Leaves can be received. A single blue Toad House is found in World 3, where players can see an album of the photos they have received (12 in total). A Power-Up Toad House's interior in New Super Mario Bros. 2. Red Power-Up Toad Houses, Green 1-Up Toad Houses, and Star Toad Houses return in New Super Mario Bros. 2. Like in the original New Super Mario Bros., some of them requires Star Coins to access, while others are unlocked either automatically or by secret exits in other levels, like in New Super Mario Bros. Wii. Completing all levels in the game, including World Star (without White Raccoon Mario) makes the Toad Houses stay permanently on the map, providing the player with endless items, including Gold Flowers and Super Stars. Unlike the previous two games, Toad Houses cannot be summoned by fireworks, as that feature is replaced by Rainbow Courses. These houses are run by Toad again and Mario and/or Luigi may select one of the power-ups provided by Toad as an inventory item, if it's empty (should be chosen first), and another as the current power-up. The player may choose not to include an inventory item too. In the first Toad House, Toad will provide a Super Mushroom and 2 Fire Flowers. After that, Toad Houses provide the same three items: a Fire Flower, a Super Leaf or a Mini Mushroom. A 1-Up Toad House in New Super Mario Bros. 2. Mario/Luigi plays a simple minigame in this house. He needs to hit a glove from below to knock 1-Up Mushrooms that Toad throws in the beginning to an above platform down to him so he could collect them to earn extra lives. It is possible to miss the 1-Ups that come down, wasting them. These Toad Houses function in a similar way as they did in New Super Mario Bros. Wii. In all of these houses though, Mario will get a Gold Flower from Toad this time around instead of a Super Star. However, a single Star Toad House in World Star that can be unlocked by getting all Star Coins in the game gives Mario a Super Star to use in his item reserve. Mario inside a Power-Up Toad House in New Super Mario Bros. U.
Power-Up and 1-Up Toad Houses appear in the Wii U game, New Super Mario Bros. U. Additionally, there is also a purple Toad House between Acorn Plains and Sparkling Waters. No Toad Houses appear if the player gets double digits at the end of a course, though a Toad will appear behind the end-of-level fortress and give the player an item. A red Toad House can be seen in the background during the game's credits; later, Nabbit is seen robbing the Toad House. There are two Power-Up Toad Houses: one involving hitting the right ? Block for the items, and another that involves Baby Yoshis. In the first one, there are three, four or five Winged ? Blocks. One will have an icon of a Super Star, another will have a Super Mushroom and the rest will have Bowser's symbol on top. Then they will disappear into the ? Blocks and the blocks will fly around the Toad House, swapping positions. When they stop moving the player has to hit the ? Blocks and they will get whatever power-up is inside it. If the player hits the ? Block with the Bowser symbol, the game ends, but they get to keep what power-ups they earned before hitting that block. In the latter, Baby Yoshis swallow icons that give the player a chance to win or lose the minigame. Balloon Baby Yoshis have the item icons which determine what power-up the player will get, Bubble Baby Yoshis hold multiplier icons that determine how many power-ups the player will get, and the Glowing Baby Yoshis hold a Toad icon or a Bowser icon. The former allows the player to get the power-up, and the latter automatically marks as a loss. The player must fit the Baby Yoshis in their respective color spots. On both sides of the Toad House are Cannons, which shoot out 1-Up Balloons, Coins, and Bowser Balloons. The player(s) must collect more 1-Up Balloons than Bowser Balloons and coins to gather up lives. Collecting the Bowser balloons decreases the amount of 1-Ups the player get in total (except those technically earned from coins). The game is over when the timer runs out. There is a single purple Toad House situated on Secret Island and it can only be reached after the game is completed via a Pipe Cannon. The Toad House contains various records, such as how many coins players have collected, how many Boost Blocks were placed, and so on. The house belongs to Nabbit. Mario inside the Toad House. Toad Houses also appear in Super Mario 3D World. They work the same as the ones in Super Mario Bros. 3, but contain two presents (big and small) instead of 3. One of them contains four power-ups, and the other contains a Super Mushroom. Each world's Toad Houses are hosted by Toads of different colors. Yellow Toads host houses in World 1 and World 2, Green Toads in World 3 and World 4, and Purple Toads in the rest of the worlds with the exception of the special worlds (Star, Mushroom, Flower and Crown). Some Toad Houses are hidden in bushes, pipes or buildings in the worlds. Toad's house as seen in The Adventures of Super Mario Bros. 3. In The Adventures of Super Mario Bros. 3, Toad Houses were shown to be the actual residences of the Mushroom People living in the Mushroom Kingdom. Toad's house in particular was a frequently used location during the course of the series. 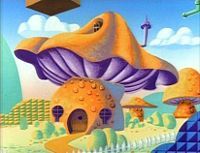 In addition to the houses, most commercial buildings were shaped like Mushrooms, such as the Mushroom Land Central Library and the Mushroom Kingdom Orphanage. Inside a Toad House in Paper Mario. The Toad House of the Goomba Village in Paper Mario. In Paper Mario, Mario and his partners can restore their HP, FP, and SP at a Toad House. They appear in almost every town, and they are each run by a Toad. The Toad House in Goomba Village has the slogan "Refresh your body and mind", while the others have "Refresh your body and soul". In the later Paper Mario games, the Toad Houses are replaced by Inns. Unlike the sequel, Mario can sleep in a Toad House free of charge. Toad Houses reappear in Paper Mario: Sticker Star. They're only seen in Decalburg, and don't serve the same purpose as in the original Paper Mario. A few Toads are trapped in the houses during the beginning of the game. Some notable Toad Houses include the Sticker Museum and the Sticker Shop. Toad Houses appear in Mario Party 9. They can only be accessed by landing on a Lucky Space. They are run by Yellow Toad, and they give the player the items on the back of the cards they turn over. It all depends on the two cards the player turns over. The Toad Houses also appear in several minigames, like Goomba Village and Toad and Go Seek. Toad Houses reappear in Mario Party 10, appearing only in Mario Party mode. When a player passes by a Toad House, all of the players enter the Toad House to obtain Special Dice Blocks. Additionally, the current captain's roulette cycles more slowly, and they have the option to discard one of their Special Dice Blocks if they already have two, unlike the other players, who cannot obtain another Special Dice Block if they already have two. Toad Houses appear in Puzzle & Dragons: Super Mario Bros. Edition where the player can make their teammates stronger or enhance their Skills using the six spots inside. Toad Houses appear the the start of each world, but the player can also access it from the Select World menu. Hosted by a green Toad, Edit Team allows the player to create and edit up to six teams of allies before entering a course. Hosted by a red Toad, Power Up allows the player to raise the XP of an ally enough to level up by depowering other allies for their XP. Depowering allies removes them from the player's Ally Box and up to five allies can be depowered at a time. Teammates getting an ally's XP will receive 50% more if their attributes match. Coin Coffers and King Coin Coffers provide a significant power up for teammates using this method. Hosted by a Purple Toad, and unlocked after clearing World 3- , Lucky ? Blocks (known as ? Lottery in the PAL version) lets the player try their luck at winning items for 100 coins each attempt. Prizes include 1-Up Mushrooms, Transformation Items and Skill Items. After clearing all the normal worlds, Lucky ? Blocks will include rare Skill Items and Star Gems. Clearing ★World 3- updates it again by giving the player a better chance to win rare Skill Items, and clearing ★World 6- updates it one last time to give the player an even better chance at winning rare items. In Super Mario Run, Toad Houses are used as decorations in the Kingdom Builder. In Mario Party 3, the buildings on the party board are similar to Toad Houses. In Super Mario World 2: Yoshi's Island, Mario's parents' house, seen at the end of the credits, closely resembles a Toad House, and in the sequel, in the beginning it shows a Toady taking Baby Mario and Baby Luigi from their parents' house, showing another resemblance. In Yoshi's New Island, the same Toad House from the first game is shown it the introduction, and a modern Toad House (Mario and Luigi's parents' house) is show in the closing scene. In Mario Kart: Double Dash! !, on the course Mushroom Bridge, Toad House-like buildings can be seen on a hill next to a dirt path shortcut, however, they do not provide power ups and the player cannot go inside them. In Mario Sports Mix, several possible Toad Houses make a cameo in the background during the tournament mode of the Mushroom Cup. In Mario Golf: World Tour, Toad Houses appear in the Toad Highlands downloadable course as objects that may be hit. In Mario Kart 8 and Mario Kart 8 Deluxe, some Toad Houses can be seen in the backgrounds of the new Mario Circuit and SNES Donut Plains 3, as well as SNES Battle Course 1 in the Deluxe version, and on the ground below the SNES and N64 Rainbow Roads. ↑ New Super Mario Bros. instruction booklet, page 13. ↑ New Super Mario Bros. Wii instruction booklet, page 7. ↑ The Interweb Toad Houses Disassembled. ↑ Nintendo Power Volume 13, pages 10, 15, 18, 33, 48, 65. ↑ The Super Mario Advance 4: Super Mario Bros. 3 Player's Guide, pages 18, 24, 49, 55, 70, 86, 99. ↑ Nintendo Power Volume 13, pages 10, 15, 37. ↑ Super Mario Bros. 3 Japanese instruction booklet, page 20. ↑ iQue's Paper Mario instruction booklet, page 27. This page was last edited on April 6, 2019, at 00:59.